February 2012 circulating coin production figures from the United States Mint have been published. Of particular note to coin collectors, mintages were revealed for the Chester Arthur Presidential $1 Coin and the El Yunque National Forest Quarter for Puerto Rico — each coin is scarcest in their respective series. In terms of the production pace, the U.S. Mint delivered 579.86 million coins for circulation in February, representing a 27.2% slowdown from the previous month but a 10.8% pick-up from the same time a year ago. As higher coin mintages can often dictate the amount of activity in the U.S. economy, February’s improvement over last year is a positive signal. Still, as the following table highlights, both months rank toward the bottom of mintage charts over the past dozen months. U.S. Mint facilities dedicated to producing American coinage for circulation (daily commerce) are limited to two, with one located in Denver and the other one from Philadelphia. The latter was significantly busier last month with its output of 369.8 million coins versus Denver’s 210.06 million. The two facilities actually tend to swap leadership on the production board throughout a year, and their outputs tend to equalize somewhat toward December. When the U.S. Mint publishes mintages for Presidential $1 coins by a specific design, they tend to be finalized. On the other hand, and while it does not happen often, the Mint reserves the right to produce more of an American the Beautiful Quarter design later in the year, which means it is possible for earlier published quarter figures to rise. That has happened in at least one instance since the American the Beautiful Quarters® series debuted in 2010. With these details in mind, the U.S. Mint has called the Chester Arthur Presidential $1 Coin mintages at 5.74 million, with 2.8 million from Denver and 2.94 million from Philadelphia. These are the absolute lowest of any Presidential $1 coin, with 20 previous Presidential honoring designs struck since the series launched in 2007. As a perspective, last year’s Andrew Johnson’s Presidential $1 Coin had previously held the scarcest mintage title with a combined 2011-D and 2011-P total of 72.66 million. The plunge is expected however, as the Obama administration in December ordered the U.S. Mint to stop producing $1 coins for circulation. The dollars are now only manufactured for coin collectors, similar to the aforementioned Kennedy half dollars. Turning to America the Beautiful Quarters, the first in 2012 honoring El Yunque National Forest is currently the scarcest in the entire series with 50.8 million struck, split out with 25 million from Denver and 25.8 million from Philadelphia. The total is at least 10 million fewer than any of the previous ten ATB quarters. 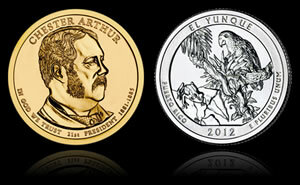 The El Yunque quarter was released into circulation on January 23, 2012. It will make an official appearance Wednesday in a ceremonial release. While it is somewhat surprising to see that El Yunque quarters are now most scarce, in hindsight it should not be completely unexpected. The immediate previous quarter honoring Chickasaw National Recreation Area in Oklahoma had a mintage that was more than double any of its younger releases. The amount likely not only satisfied but could have overreached quarter demand, resulting in cutbacks for El Yunque quarters. Time will tell. The U.S. Mint is already busy producing the next Chaco Culture National Historical Park quarter for New Mexico with at least 43.8 million minted. The Chaco Culture quarter is expected to enter circulation beginning on April 2, 2012. As such, it is possible its mintages will be revealed next month. Well, now that they’ve minted 5.74 million of the Arthur Dollars….how ’bout RELEASING THEM?? I can’t wait all day..!!! Huh, didn’t realize collectors bought and put away 5.7+ million presidential coins. There’s certainly nothing rare about these coins. About releasing the coins – we all know how the deputy director of the mint can’t manage his way out of a paper bag or apparently make a decision to save his life, so it’s no surprise that coins that were once promised for middle of Feb have yet to be announced let alone actually delivered. Don’t hold your breath. I’m still waiting for the 2012 Native Am’s too. Beautiful design, but when is the release date? Just need a few of those and a few Chesters. Looks like abolishing the penny would give a 60% cut in production resources at the Mint. Considering that they are hardly considered a popular collector’s item any more, that might work well for both the Mint (cost savings) as well as the collectors (relative rise in value of pennies still circulating). Good points guys. I guess I’m going to have to pull double duty up there as the new marketing director AND the new product release coordinator. I’ll whip those lazy govt. workers into shape. Here’s my 5-year plan: Abolish the penny, create a new 2-cent coin with Reagan on it, release only 100,000 Presidential Dollars a year, randomly plant 100% silver dollar coins in those P&D rolls (remember inserts in packs of baseball cards? ), release way more commems each year and cut their production to keep them desirable, things like more Native American coins, more Military coins, and then start in on a famous American series. I’d change the dime from FDR to Teddy Roosevelt and sell them in collector P&D rolls (not forgetting the randomly packed silver dime…!). That oughta shake up the coin collector market a bit, eh? Don’t forget Kill (the dollar) Bill – the savings alone could pension off every displaced Crane Paper worker for far more than most of us could dream of. Fill the gap between $1 and $5 with a modernized $2 bill, or maybe a small $2 coin like they have in Australia. TR did more for American coinage than any other president so he definitely deserves his place in the sun. And I can think of a couple of hundred people I’d like to see on a Famous Americans series -Thomas Edison, Mary Cassatt, Jonas Salk, Helen Keller, Duke Ellington, Mark Twain just for starters. Heck, I’d even go along with Elvis. Well, since I don’t work for the Bureau of Engraving & Printing anymore, I can’t abolish the $1 FRN unilaterally. But the 2 cent coin idea is definitely getting some traction. If not Reagan’s mug on it, I say John Adams….2nd President and all that. How large to make it though? The public nearly lynched me for the Susan B. Anthony Dollar coin, even though I told everyone that it’s NOT a bloody quarter…!! I may have to slip it in between the dime and the nickel and bronze tone the thing. What has happened? They are not minting anymore Presidential Coins. This is just great. After you purchase a great big catalog for all of them up to Ronald Reagen, then they go and do this, I would like to kn opw where I can order one coin of Chester A. Arthur. Can you let me know. This Obama Adfministration is for the birds. They should have impeaced him long time ago. produce Presidential coins, but only in collector rolls which you may purchase from them. I want a Chester, too, and all the rest! Dang it, I am not an avid coin collector, but I like the Presidents! I’ve got a nice frame on the wall for them all, and I’m not going to get any further…? I have a 2012 El Yunque misprint error coin. Puerto Rico and E Pluribus Unam printed backwards! Anyone else come across this?